Let your Daddy know he rocks with beautiful hallmarked Sterling Silver Plectrum, that can be engraved and personalised to your requirements. The Solid Sterling Silver Plectrum is handmade by our silversmith here in Birmingham's prestigious Jewellery Quarter and embossed with a great Daddy Rocks motif. Each Sterling Silver Plectrum comes packaged in a lift off lid presentation box, making it an ideal gift for any budding musician or your good old Dad!. 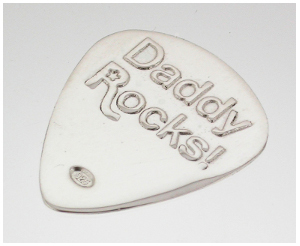 Daddy Rocks Sterling Silver Plectrum is handmade to order, and is engraved and dispatched in one day.